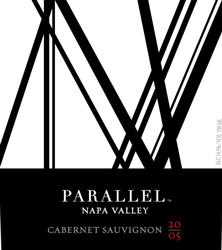 Parallel's philosophy is to carefully select the best fruit from several unique Napa Valley terriors, allowing our winemaker, Philippe Melka to make several lots of wine and then blend these lots into the finished Parallel Cabernets, which have been terrific every vintage. Additionally, our portfolio boasts a Russian River Chardonnay, aged gracefully in French oak puncheons in our wine cave. Want to taste our wines while you're in the valley? We would love to host you for a guided, seated tasting at our home at Brasswood, just a few miles north of St. Helena. Our New Tasting Menu, includes three different options - all with new pours and new pairings! For more information, please visit our website: http://www.parallelwines.com/Visit-Us. Please note: Tastings are popular and our space is limited. We suggest securing your reservation at least 3 days in advance. However, some cancellations occur, so please contact Adrienne D. Capps, Director of Hospitality & Marketing, for availability within 3 days. Music in Tasting Room: Light, contemporary music. View from Tasting Room: Take a stroll in one of Napa's biggest caves at the base of the St Helena mountainside or enjoy the view of the valley floor. Wine Education: Guided tasting from our CIA Chef/Wine-Trained Host, Adrienne Capps. Enjoy our three award-winning releases: Russian River Chardonnay, Napa Valley Cabernet, and “Black Diamond” Reserve Cabernet along with one special pour from our Library Collection. Food Available: Our wines are accompanied by either a selection of small bites and cheeses from the Brasswood Bakery or small plates from the Brasswood Restaurant. Both options perfectly pair with these stunning Philippe Melka wines. To join the wine club, visit www.parallelwines.com or call 707-486-1100. Tapping into our shared passions for wine and skiing, Parallel Napa Valley has a two-tiered wine club. Our "Black Diamond" Wine Club members enjoy shipments of six bottles three times per year and our "Double Black Diamond" members receive case shipments all in Feb, May and Sept.
For more information, please visit: http://www.parallelwines.com/Wine-Club. Or feel free to contact our General Manager, Adrienne D. Capps, directly at (707) 592-4985 or adrienne@parallelwines.com.